I had a week of free time between turning in my copyedits on SHADES OF WICKED, Night Rebel book one, and receiving my galley pages for it, so I did something I haven’t done in years – took an actual vacation. 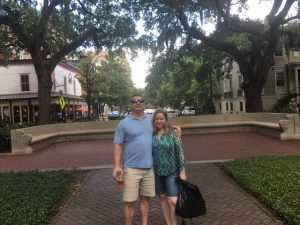 Hubby and I went to Savannah, GA over the Fourth of July. The historic district of Savannah reminds me a lot of the French Quarter in New Orleans, only with fewer drunks because there’s no Bourbon Street (hubby considers this a negative, but it’s a plus sign in my book ;)). We did the tourist thing and went on a few tours. Of course one was a ghost tour. 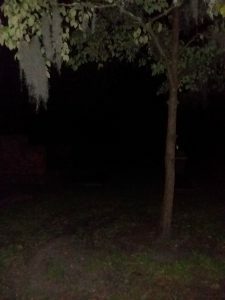 I took a picture in a supposedly-haunted cemetery at night. The next day, I was excited because I thought I’d captured an orb right next to a tree. On closer examination, however, it appears to just be the flash reflecting off a leaf, but here. You decide. Ilona’s reply: You look great! *grins* Once again, see for yourself, though you might need to put on shades first. Don’t say I didn’t warn you ;). Right before I went out of town, I got an email saying that the Night Huntress series had been included in Ezvid Wiki’s “13 Dark and Delightful Paranormal Romance series.” I was flattered to be included, of course, and doubly flattered by the company I was in because I’m a fan of many of the other series that were chosen. Be sure to check it out if you’re looking for new book recs. 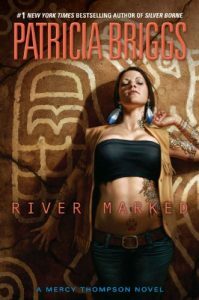 Speaking of book recs mentioned by the above link, I’m currently reading RIVER MARKED, Mercy Thompson book six. Yes, I’m late to the Mercy party because this book was published years ago, but that only means I don’t have to wait to read the next ones (victory!) I really enjoy this urban fantasy world of werewolves, shifters, vampires and magic. I’ve also really enjoyed its spinoff, the Alpha and Omega series. If you’re looking for something on video versus page, here’s a movie that had me and hubby laughing all through it: The Final Girls. Yes, this came out a few years ago as well, so once again, we’re late to the party. However, I was in the mood for a silly, B-movie, comedic horror, and that’s exactly what this is. It even had an unexpected heartwarming moment between the campy laughs. If you were a fan of the 80’s slasher movies, and Friday the 13th especially, this spoof of the genre will probably make you laugh, too. That’s it for now. Onward to checking the galley pages of SHADE OF WICKED, which is my last chance to spot errors, make small changes, and generally second-guess every word I’ve written, heh. Once I’ve done this, I’ll probably post another snippet, so stay tuned! I’m SO glad you were able to take a vacation. I know it’s been a long time, and I’m sure you needed the decompression time. I’ve never been to Savannah, so enjoyed reading your descriptions. Both you and Ilona run yourself in the ground. Stop! All your fans want you around for a long time! YAY! You got some down time. Wow, I knew only one other author on that list, Christine Feehan. I just recently finished Faith Hunter’s Jane Yellowrock series. Looking forward to The Night Rebel series.